Getting to the Brandywine Valley, southern Chester County PA, northern New Castle County, DE. The Valley is not far from I-95 and is easily accessible from all points. We recommend using a Web-based mapping service like Google Maps, Yahoo or Mapquest, to provide detailed driving instructions or use your gps gizmo if you have one. If you use Buckley's Tavern's address (below) as your destination, your driving directions will put you in the heart of the Brandywine Valley, between Longwood Gardens and Winterthur. 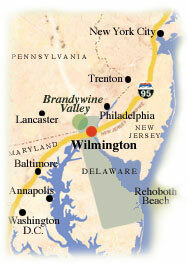 The Brandywine Valley is accessible from both Wilmington and Philadelphia by rail. Both cities are on Amtrak's busy Northeast Corridor rail line, and there are dozens of regularly scheduled arrivals and departures daily. The train stations in both cities are carefully restored landmark buildings that also offer access to local transportation and provide information about local hotels and attractions. The closest airports are Philadelphia International (PHL), Baltimore/Washington International (BWI), and the New Castle County Airport, just south of Wilmington, which is a facility for private and corporate aircraft.